Operating voltage range covers 24VDC ~ 110VDC, 60VAC ~ 80VAC; Operating current range 0.1A ~ 8.3A (peak current); Support pulse / direction or double pulse control mode, can receive differential and single-ended signal instructions; Optocoupler isolation signal input , Anti-interference ability; provide 15 standard micro step segmentation settings, the maximum subdivision of 256 (51200ppr), allowing users to subdivide the maximum within the micro step arbitrarily set the number of segments; to provide seven conventional current Set the value, allowing the user to set the current in the maximum operating current range of any resolution of 0.1A; control pulse stops more than 400ms, the motor current is automatically reduced by half, to further reduce the motor heat; to provide graphical the optimal control parameters can be automatically generated for different motors to maximize the performance of the motor; built-in micro step subdivision algorithm to achieve low subdivision control instructions, high subdivision operation effect; high reliability Sexual, provide overvoltage, over current and other protection features. Series Overview High-quality digital stepprofessional debugging software Pro Tuner, through RS-232 communication interface configuration drive control parameters, but also set the trapezoidal wave velocity test mode and point motion test mode; for the characteristics of motor operation, low speed, medium speed with different anti-vibration strategy to ensure smooth operation within the motor speed range; per drive DM series products, using the latest 32-bit DSP processor, a collection of nine revolutionary motor control technology, can drive 35-130 full range of two-phase, three-phase stepper motor. For different motors can automatically generate the optimal control parameters, maximize the performance of the motor, the motor runs to achieve ultra-stable, ultra-low noise, ultra-low fever, "three super performances." 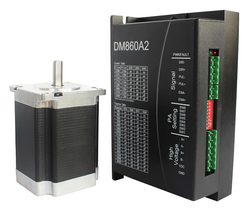 Looking for Stepper Drive & Motor ?